How Deep Do I Dig for a Landscape Rock Garden? Hills present a challenge in landscaping. Without planning, the area may present an eyesore. Erosion, landslides, weeds, run-off, wasted topsoil, mulch, gravel and other topical treatments provide ongoing hassles without ongoing maintenance. Landscaping with rocks provides a cost-effective solution that can turn a hill into a pleasing focal point on the property. With some planning plus the right tools and materials, you can create a hill landscape that's an asset to your property. 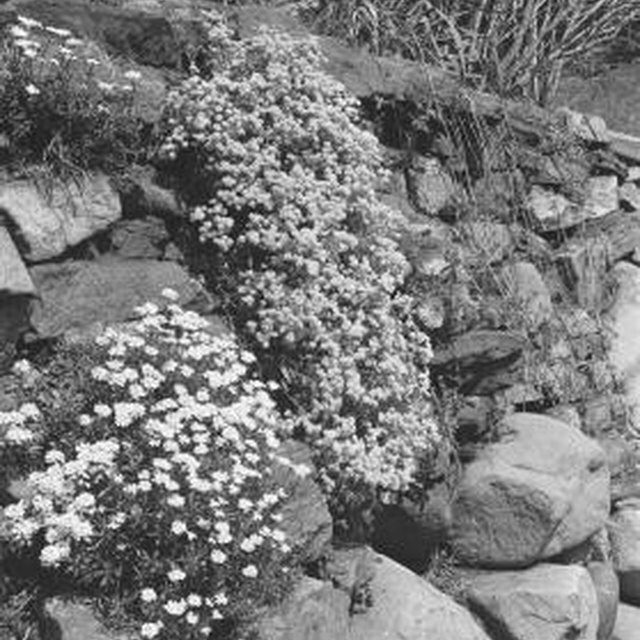 Partially buried and naturally arranged boulders provide interest and erosion control for a hill landscape. Look over some pictures of hills with rock landscaping. Designs range from rocks that form planned patterns of abstract art to natural-looking landscapes where the rocks sit in the earth amid native plants to create the look of a long-standing natural terrain. Adding plants to the hill will help reduce erosion by creating a network of roots that hold the soil. Choose what types of rocks and plants you will use for the hill landscaping. It may be useful to list the pros and cons of the materials you are considering. For example, lava rock comes in black and red and have the advantage of being porous and lightweight. They may be more convenient to carry up the hill than solid boulders. Mark the desired positions for the largest rocks or boulders with plant stakes or tent stakes. Go down the hill and check the effect from different vantage points. For a natural effect, place the rocks in a random configuration with uneven spacing. For a more formal effect, place rocks in a pattern, such as a spiral, or space them evenly apart. Dig a hole into the hill for each boulder. Make the hole large enough to bury at least 1/4 of any boulder or large rock. The larger and heavier the rock, the deeper you need to seat it in the earth to reduce the risk of a rock slide and potential property damage or injury. For example, if the boulder is 40 inches tall, make the hole 10 inches deep. Place each rock or boulder in the corresponding hole and fill the earth back in around it. Stamp the earth firmly around the rock with your feet. Add plants between the boulders, if desired. Use a trowel to make holes the depth of the ground cover plugs. Plant them 4 to 6 inches apart. Creeping ground cover plants spread to create an economical landscaping feature. Growing Irish moss or other low ground covers adds to the natural effect of the rocks on the hill and gives the impression that the rocks have always been a feature of the landscape. Water the plants right after planting them.